39-year-old Lukas Zaskodny outlasted a field of 191 entries to win the 2017 World Series of Poker Europe €2,200 pot-limit Omaha event at the King’s Casino in Rozvadov, Czech Republic. 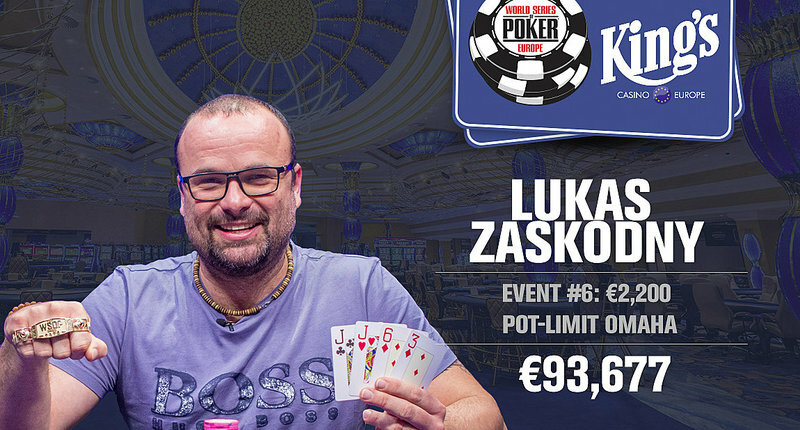 For the win the entrepreneur from Prague was awarded the €93,677 ($109,602 USD) top prize and his first WSOP gold bracelet. “It’s an amazing feeling. I’m really happy. It’s special for every poker player to win a bracelet, and I have it now. I’m happy that my friends could be here with me,” Zaskodny told WSOP reporters after coming out on top. Zaskodny defeated Allen Kessler heads-up to secure the title, denying the American poker pro his first bracelet. Kessler has now finished as the runner-up in WSOP bracelet events four times. Kessler has cashed in a total of 58 WSOP bracelet events since he first finished 16th in a $5,000 Omaha eight-or-better event back in 2001. Zaskodny and Kessler came into the eight-handed final table as the second and third shortest stacks. Zaskodny was able to wins some key pots early at the final table and then pick up three knockouts on his way to the final heads-up showdown with Kessler, who survived to short-handed play before mounting a comeback. Kessler eliminated Krasimir Yankov in third place ($47,213 USD) to take roughly a 3-to-2 lead into heads-up action. Zaskodny came out of the gates swinging, dragging three straight pots to overtake Kessler for the lead. On the final hand all of the money got in on the turn with the board showing J-7-2-2. Kessler had the A-J-3-2 for twos full, but Zaskodny held the J J 6 3 for the higher full house. Kessler needed to hit the last two in the deck in order to stay alive in the even. The 10 was no help and Kessler was sent to the rail in second place, earning €57,897 ($67,739	USD).